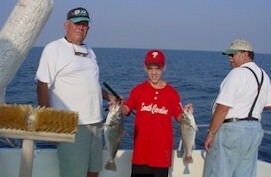 Enjoy the finest in Chesapeake Bay Charter Boat Fishing on Maryland's Eastern Shore. Fishing for Spring Trophy Striped Bass, locally known as rockfish or stripers or summer Stripers, Spanish Mackerel & Bluefish. Bottom Fishing for Spot, Croakers and other species. 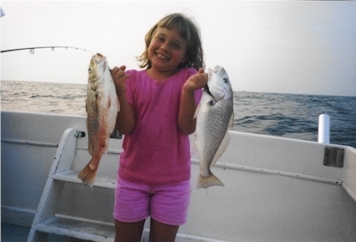 Sawyer Charters offers some of the finest Maryland Eastern Shore Sportfishing. In addition to the finest in Chesapeake Bay fishing, we also offer Chesapeake Bay lighthouse tours, nature cruises and other Chesapeake Bay tours, floating crab feasts, and cruises to various destinations along the Chesapeake Bay. Atlantic croakers, also known as hardheads, are usually caught in the Chesapeake Bay and neighboring rivers and tributaries between June and August, usually in the evenings. They range between 9" and 18" in length, but often fight as if they're twice as big. They are known most for the constant drumming sound that they make, which can sometimes be heard before they are even pulled out of the water. Contrary to what a lot of people think, this noise is produced by the beating of their stomach muscles against their swim bladder, not by a set of loose bones inside their heads, which don't even exist. In addition to the Chesapeake Bay, these fish are found up and down the Atlantic seaboard, in the Gulf of Mexico, and all over the world, from South America to Asia. They are generally found in warm, tropical waters. Wherever they happen to be, they are almost always a bottom-dwelling fish. Bottom fishing with squid, bloodworms, or Peeler crab is the most effective technique for catching these fish.